My name is Kristen, and I am a Dendrobium addict. Maybe it’s because a dendrobium was my first orchid ever, but I really think it’s about the form. There are so many: huge, tiny, slender, fat, hairy, smooth, pendant, creeping, erect, etc. And doesn’t even count the beautiful flowers! Dendrobium is the most diverse of all the orchid genera, save Bulbophyllum. 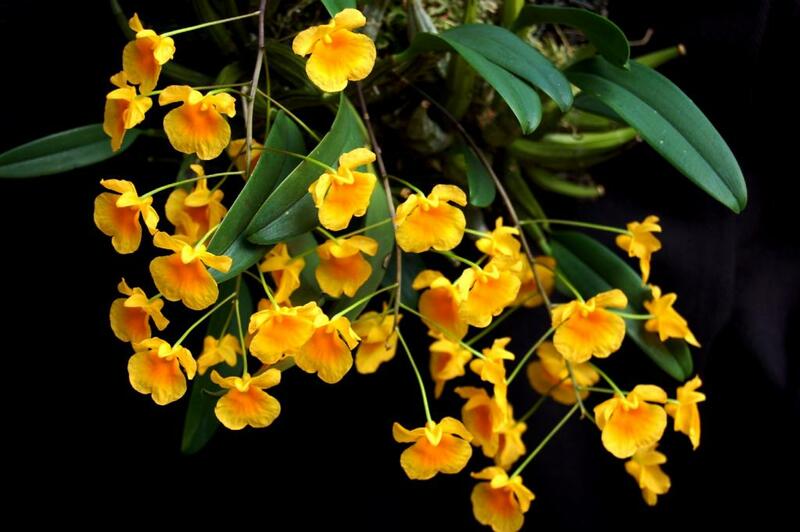 When you consider how many more Dendrobium hybrids have been made, though, Dendrobium wins hands down. Another great thing about Dendrobiums is that they’re tough as nails. 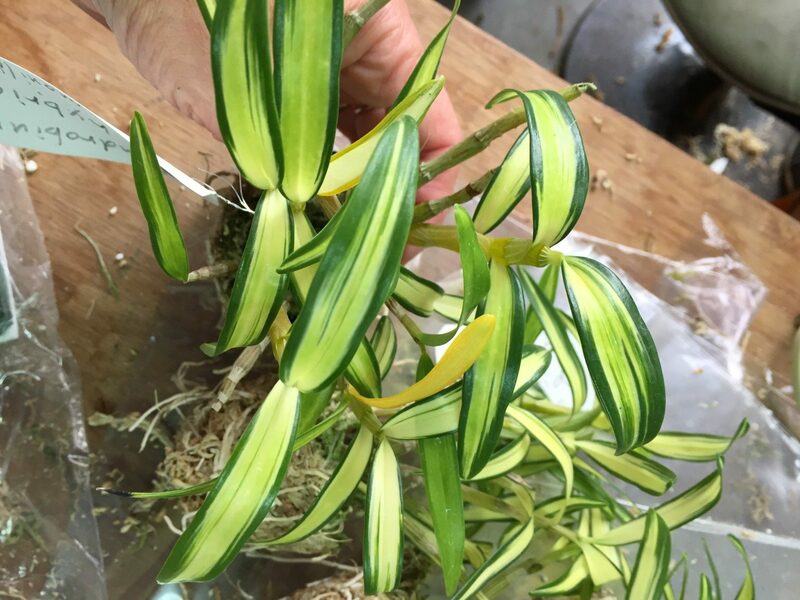 They can look like they’re on the brink of death, and they’ll still kick out a keiki (baby growth): “I’m not dead yet!” Many times people mistake leaf loss for plant unhappiness; however, Dendrobiums often lose their leaves either for the winter or when they are getting ready to bloom. I no longer sweat leaf loss; I just figure we are moving on to blooming phase. 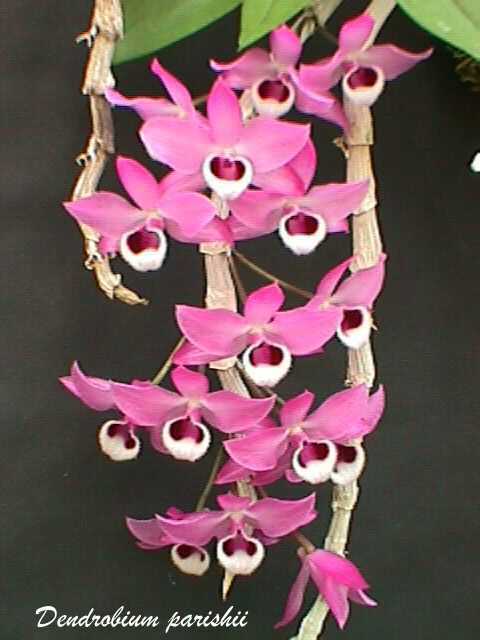 In addition, many Dendrobiums tolerate a wide variety of temperatures. If you have read the D. moniliforme care sheet, you know that they tolerate temperatures over 100 down to about 15. Yes, 15. Many others are intermediate to warm growers which make them perfectly suited to just about the whole US. 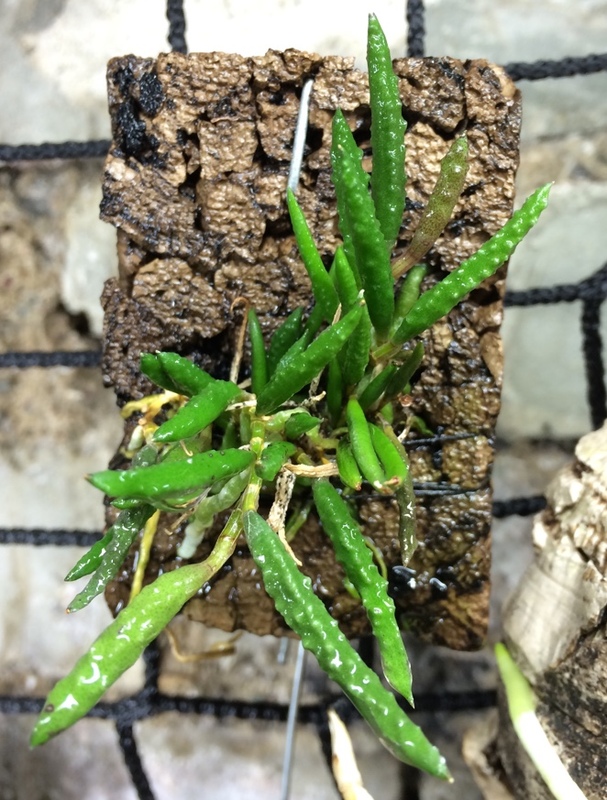 I have probably heard more people say they can’t grow Dendrobiums than nearly any other genus (except Masdevallia–and that’s a subject I’ll hit soon). That makes me sad because it’s not possible. 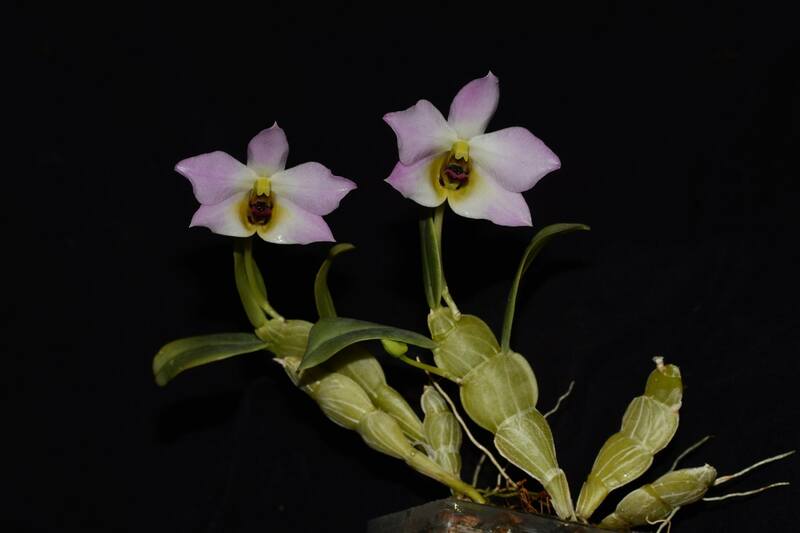 Dendrobiums are one of the many orchids that thrives on benign neglect. Most of them like to dry out between waterings, especially when the temperatures are on the cooler side. I generally keep mine well-watered and fertilized in the summer and back off in the winter. 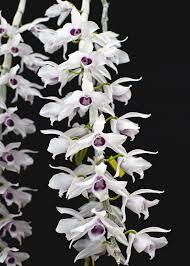 While most dendrobiums like a lot of light, there are a few that prefer more moderate or even low light. I always go to www.orchidspecies.com (an amazing resource–donate a couple bucks if you use it regularly like I do) when I am contemplating a new species. See where it came from and what it likes. I always suggest that people put their dendrobiums out for the summer (never in direct sun) as they require daily temperature fluctuation to trigger blooming. I learned this as a beginner when my plants would grow beautifully but wouldn’t rebloom. Frustrated, I bought a book on orchids (this was before the internet existed) and read that dendrobiums require a 15-degree daily temperature flux to bloom. Aha! Turns out this simple trick helps many species to bloom. D. cucumerinum: pickles as orchids. ‘Nuff said. D. trantuani: flat pseudobulbs are amusing, and flowers are gorgeous. My husband thought someone had stepped on these guys. D. anosmum: Pendant, naked canes produce ridiculous numbers of flowers. 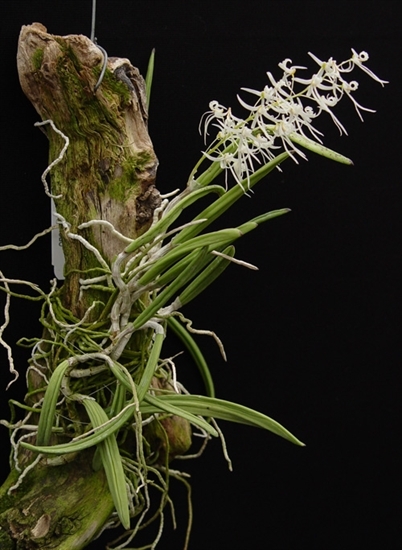 D. parishii: Slightly pendant canes; flowers are gorgeous, fuzzy-lipped, and fragrant. While I have listed plants that tend to be on the smaller side, there are hundreds of big dendrobiums, too. My suggestion is to pick one that speaks to you and give it a try. You may find a new addiction.